China will allow its basic endowment pension fund to invest in stock markets, according to draft regulations posted on the Ministry of Finance’s website. The fund also will be allowed to invest in domestic bonds, stock funds, private equities, stock-index futures and treasury futures, according to the draft. The proportion of investment in stocks, funds and stock-related pension products will be capped at 30 percent of the pension fund’s net value, according to the proposed rules posted Monday. Chinese stocks entered a bear market Monday, as the exodus of over-leveraged investors overshadowed central bank efforts to revive confidence with an interest-rate cut over the weekend. Chinese regulators are expected to take additional steps to steady the market, including possibly suspending initial public offerings. Feedback on the draft rules can be given until July 13, according to the statement. The basic pension fund’s outstanding value was 3.59 trillion yuan ($578 billion) at the end of last year, the official Securities Times reported in May. Short positions held by the basic endowment fund in stock-index futures and treasury-bond futures shouldn’t exceed the book value of the targeted stock indexes or treasury bonds, according to the draft rule. Money can also be used in equity investments for restructuring companies or in public listings of major state-owned companies, it said. The money can only be invested domestically. The Shanghai Composite Index dropped 3.3 percent Monday to close at 4,053.03, taking the decline from its June 12 peak to more than 20 percent, entering bear-market territory. The gauge swung between a loss of 7.6 percent and a gain of 2.5 percent on Monday, its biggest intraday point move since 1992. The recent selloff brings to an end China’s longest bull market, a rally that lured record numbers of individual investors and convinced traders to bet an unprecedented amount of borrowed money on further gains. Saturday’s interest-rate cut, along with assurances from the securities regulator that risks from margin trading are controllable, failed to ease concerns that speculators are unwinding their positions. With all eyes on Greece, people probably don't want to know about a Chinese equity market rout to the tune of $3tn (£1.9tn, €2.7tn), prompting the communist government to throw in "everything but the kitchen sink" in response to this bursting bubble. Chinese equities have shed 30% of their value since around the middle of June as an army of 90 million individual investors, which dominate the Chinese stock market, have sold shares as prices have fallen. 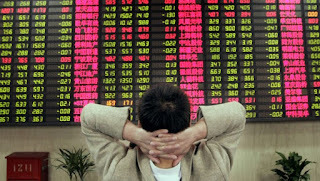 To combat this the Chinese government has been shovelling cash into blue chip stocks and telling people not to panic. Meanwhile, since Monday 6 July volatility has been taken to new levels: the Shanghai Composite lost 5.1% before finishing 1.3% down and the Shenzhen was down 5.59%, taking it nearly 14% off early Monday's high, while the Shanghai Comp is 8% off these highs. Maybe the Chinese government still finds it difficult to accept the fact that financial markets cannot be driven by policies and stock returns cannot be dictated by an authority. Some 760 companies have suspended trading in their shares, equivalent to a freeze of $1.4tn, or something like one fifth of China's stock market value. Economic consensus states China needs a thorough transformation of its economy away from a growth model that's based on exports and investments and in many cases over-investment that creates bad debt, to one that's driven by the consumer economy. But pumping up the economy is unsustainable and could have the opposite effect of offloading losses onto household sector. The Chinese growth story has been driven by margin lending, a means by which investors borrow money to invest using shares or managed funds as security. In times of high growth this technique can boost returns, but it can also magnify your losses. Another risky factor in this equation is the country's large shadow banking system of non-bank financial intermediaries, using all manner of securitised vehicles and asset-backed means of market making. Meantime, the nations' media has again tried to lend its support to calm nerves with the Securities Journal suggesting that the Chinese economy has the basis of a long-term bull market. People's Daily reported: "Confidence is more precious than gold. That's what Chinese investors need at this moment; confidence, not panic." Analysts at Rabobank said: "Basically, China had hoped an equity bubble would rescue its property bubble while not worsening the debt picture: those hopes look forlorn, with serious consequences for all of us. "Most worrying is that there isn't really much China can do at this point: if a retailer's share price means it needs double-digit retail sales growth for 20 years ahead to get the Price-to-Book value back to a reasonable range, what difference will 25bp, 50bp, 75bp, or even larger reductions in benchmark interest rates, or equivalent cuts in reserve ratios, make? (Though that is unlikely to stop China's journey towards ZIRP and QE, as the US, Japan, and Europe have shown.)" Creating a sovereign fund to mitigate the non-fundamental shocks is generally a good idea for emerging markets, but to assign a political task to these funds that they need to support the market index to a certain level simply won't work. Pumping investment into stocks of large state-owned enterprises which are large cap stocks means the index is supported to an extent, but most of the other stocks still fall harshly, many of them more than 10%. Assistant professor of finance Lei Mao, of Warwick Business School, said: "I am surprised at the actions of the government; these actions are like casting political pressures to modify the trading behaviour of investors or to blatantly dictate how investors should trade, just to meet the political goals the government wants to achieve from the stock market. "If the government aims to sustain a healthy market as a venue for financing, the rise of state-owned enterprise stocks are only aesthetically meaningful, since these enterprises never need any financing and they are not good investments anyway. "When you create a sovereign fund and the purpose is to achieve political value from a rising market, then the allocation of funds will inevitably be distorted." Professor Lei pointed out that the Chinese government has restricted public funds from selling certain stocks – particularly, the pension funds are not allowed to sell any stock. This kind of direct ban destroys portfolio reallocation in the current market conditions, and the market is again distorted. "These distortions, in today's market, create a significant flow of funds to large state-owned companies – a 'flight to state'. Plus they might create the reasons for another free-fall in the near future. "Even an optimistic investor should not participate in the market for now. The government should learn, if not from the long histories of other markets, from their own mistakes," he said. A look back at Japan's dramatic economic slowdown in the 1990s suggests several lessons for China. Forecasters were extremely slow to recognise how much Japan's growth potential had dropped and the collapse of asset prices had profound and long-lasting effects. Global growth was not very badly affected in the following decade, with advanced economies performing quite well, but there were negative regional spillovers that contributed to the Asian crisis in 1997-98. Trade exposures of the major advanced economies to China today are mostly quite moderate and similar to exposures to Japan in 1990, with the exception of Germany. Analysts from Oxford Economics said: "Asian countries have intense trade links with China, greater than they had with Japan 25 years ago. The direct impact of a sharp Chinese slowdown would be centred in Asia, as was the case following Japan's crash in the 1990s." I've repeatedly warned you, forget Greece, it's the China bubble you should be worried about. Bloomberg reports that China is suspending initial public offerings, creating a market stabilization fund and telling investors not to panic in an effort to shore up its stock market, which has had the largest three-week drop since 1992. 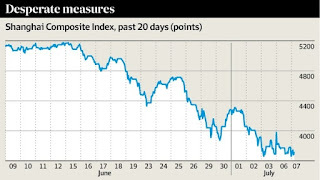 In three weeks, the Shanghai Composite Index has wiped off more than $3 trillion, or a quarter of its value, ending a spectacular bull run which saw the benchmark index rise as much as 150 per cent in the 12 months to June. So what exactly being done to try and prop up the country's see-sawing sharemarket, are the measures working? Are there any proverbial rabbits left in the hat to pull out? The People's Bank of China (PBoC) lowers its 7-day reverse repurchasing agreements lending rate, an indicator of interbank funding ability, by 3.35 per cent to 2.7 per cent. This makes it easier for banks to get their hands on capital to lend. PBoC cuts interest rates for the fourth time this year. Borrowing and deposit rates cut by 25 basis points to 4.85 per cent and 2 per cent respectively. Banks have their reserve requirement ratio - the amount of capital they have to hold to sustain their loans - cut by 50 basis points. This is the first time since 2008 both rates have been cut simultaneously. Chinese government allows its state-owned pension funds to invest in the share market for the first time, injecting up to 1 trillion yuan into the market. Lowers its 7-day reverse repo rate again, from 2.7 per cent to 2.5 per cent. This injects 50 billion yuan ($A10 billion) into financial system through reverse repos. No retail investor likes fees and to kick off July, the Shanghai and Shenzhen exchanges announce plans to lower transaction fees for share trading by 30 per cent by August. The very next day, the China Securities Regulatory Commission (CSRC) loosens rules on margin financing, changing its strict stance on the practice of trading shares on borrowed money. Margin lending, again to retail investors, is widely believed to be behind the market's bull run earlier up to June. The CSRC said it was investigating irregularities between securities and futures trading across multiple markets. Reuters reports a source saying the Chinese Financial Futures Exchange has banned 19 accounts from short-selling for one month. Some 28 companies which had upcoming initial public offerings are made to postpone their floats, and the China Securities Regulatory Commission said there would be no IPOs in the near term. There have been more than 200 IPOs this year alone and were heavily oversubscribed. The 21 top Chinese brokerages also agree to plough 120 billion yuan in blue-chip exchange traded funds, billed as a sharemarket rescue fund. They will hold the stocks as long as the SCI remained below 4500 (in Tuesday morning trade the index was at 3745). State-owned investment firm Central Huijin had bought exchange-traded funds and promised to buy more. The regulator CSRC said the PBoC will inject 250 billion yuan into 11 financial institions to increase liquidity in a bid to stabilise the sharemarket which has tumbled into bear territory. The State Council announces the establishment of a 100 billion yuan national insurance investment fund. Local media reports Chinese state pension fund, the National Social Security Fund ordered its managers "not to sell a single share". Communist party newspaper The People's Daily warns people "not to lose their minds" and "bury themselves in horror and anxiety" as the measures will take time to produce positive results. The China Financial Futures Exchange imposes a daily trading limit of CSI 500 index futures effective to 1200 lots for rise and fall, effective from Tuesday, state media outlet Xinhua reported. Trading halted in 25 per cent of listed shares representing 700 mostly smaller stocks. The market fell again on Tuesday morning, down 4 per cent at noon AEST. So perhaps we can say the market has not obeyed the government's edicts. 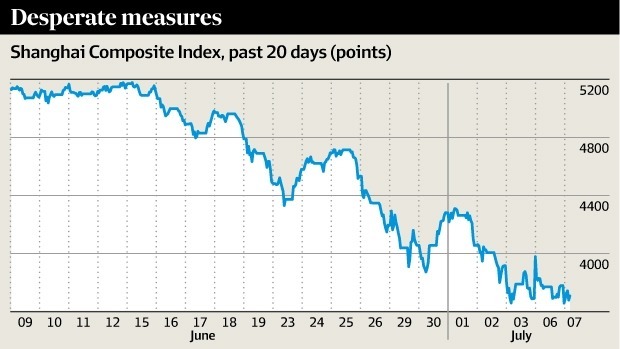 While Xinhua reported that the weekend's measures were responsible for Monday's 2.41 per cent rise, ANZ senior economist Jo Masters said they were "short term fixes". "A modest lift in the Shanghai Composite... may be soothing some nerves, but at what cost?" Ms Masters wrote. "There is still a deleveraging process to go through, which risks tightening market liquidity conditions," she said. "Fundamentally, the Chinese economy has found firmer footing over the past two months due to policy easings," Raymond Ma, portfolio manager of Chinese equities said. "Although investment demand and exports remained weak, green shoots are emerging in key areas such as property sales and consumption. "As fundamentals are improving, I am seeing more value in oversold sectors such as Chinese insurance companies, brokers and selected information technology plays, which have declined for 20 per cent to 30 per cent over the past month or so," he said. IG markets strategist Evan Lucas said however the central bank and government's attempts to stem the bleeding "appears to be futile". "The next steps would be increasing liquidity funds even further, with the PBoC backstopping and increasing pension funds exposure as well, some state-owned pension funds are already doing this by banning their advisors from selling," Mr Lucas said. "That would be the scorched earth scenario, it would mean the regulator becoming one of the largest shareholders," he said. He added that while he expected the plunge to slow, the ramp up in the preceding 12 months had been "just as biblical". Below, with the Chinese authorities now allowing investors the chance to lever the value in their own residential property to buy into the Chinese stock market, IG's Evan Lucas looks at what is going on in this market. Also, Alastair McCaig points out the need for stops when trading this market. I say avoid it altogether, lots of potential but too much hype, speculation and government intervention.